The Giro enters its endgame in the form of the Dolomites. Three of the final seven mountains are ascended today, so anyone still nurturing hopes of improving their position on GC will have to be in form and alert. Each climb varies considerably in characteristics from the next. The Passo San Pellegrino lasts a lengthy 18km and makes it difficult to establish a rhythm, with constant shifts in gradient. The Passo del Redebus — which is tackled some 70km later — is a lot steeper at an average of 8.5 per cent, but requires a considerably shorter effort at just 4.5km in length. A long descent brings the riders to the foot of the final climb to the finish: the Rifugo Panarotta. This is the most difficult of the lot — at 16km, it’s comparable in length to the San Pellegrino, with an average incline of eight per cent that hardly fluctuates throughout. 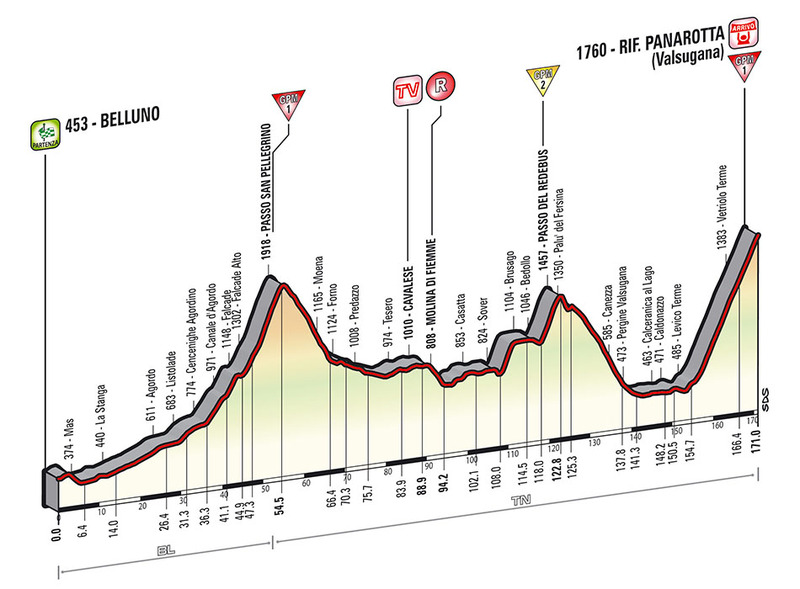 Stage 18 continues this year’s trend of mountain stages featuring three climbs. Usually, there’s one stand-out stage with four or five accents, but it’s difficult to single-out a queen stage of the 2014 edition, with no one day featuring any more than three mountains. Consequently, today is one of the most significant in the King of the Mountains classification. Any riders still in contention will be wise to get into a break early on and do their best to get as many of the available points as possible — though they’ll be in for a long, hard day with so much distance between each summit. The Dolomites are known for ski resorts, but are also home to many other leisure activities. This being a mountain range, they are almost exclusively dangerous; none more so than base-jumping, an extreme sport in which participants hurl themselves from cliffs and hope their parachutes work before they reach the ground. We’ll stick to riding our bikes.